September 14th is Customer Appreciation Day over at the Little Miss Muffet Stamps store and there are four new images released that were previously only available to challenge winners. Now they can enjoy these favorites plus one of them is a freebie to use as a background element. The freebie will be for everyone to enjoy and can be found in the store! Customers from the past six months should also check their inboxes for a special LMMS Newsletter that will have free gift details inside - as a thank you for being a customer! You must be subscribed to the newsletter in order to get this! Also remember that September 15th is the last day for 50% and 20% off rubber stamps, metal dies, books and more. 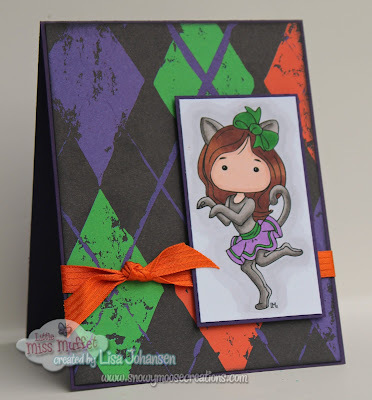 It's Inspiration Week over at the Little Miss Muffet Stamps blog and I'm still rolling along with Halloween cards. This week I'm using Polka Dot Pals Zappa, isn't she fun? I left a sentiment off the card so it can be personalized to any type of Halloween themed greeting. Ok LMMS fans, be sure to head over to the LMMS store to take advantage of the sale before it ends, and then come over to the blog and join the Anything Goes challenge!